I have been taking photos for over 35 years but it was not until I started using a camera with articulating screen that my photography improved perceptibly, something that without a doubt, comes from better composition and unusual angles of perspective. Different camera brands have different solutions on how they solve the articulation. Some just fold up (allowing you to take selfies), others fold up and flip down, and some do it all (flip, tilt and swivel) in the same manner as screens on camcoders do. We all age, I'm currently 54 and I prefer to use a camera with flip-out lcd because it allows me to angle it in any direction to compose my shots.. comfortably, instead of having to crawl around with my eye in the viewfinder. I also do a lot of street photography and the ability to see what my shot will be like while holding my camera at waist level (or aloft over crowds) is very convenient. Hinged camera screens are of course also a must if you enjoy taking selfies or doing street photography. 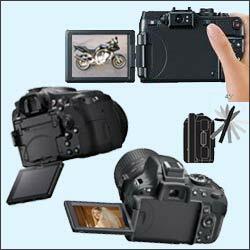 Pro-Spec DSLR Cameras With Flipout Screens - Compose your shots with ease...? This is not the right way to do it. This is a good example of what life used to be like with a traditional digital SLR camera setup. 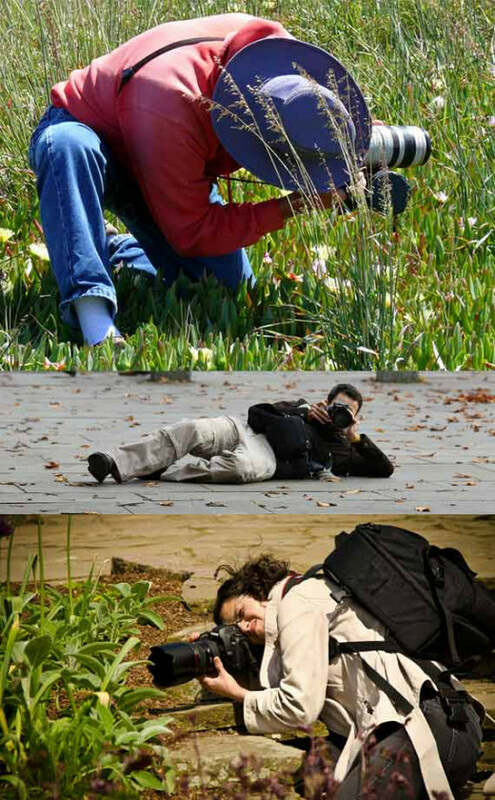 Composing a shot while kneeling and even laying down does not make you a better photographer. Check out how they struggle to get their eye to the viewfinder! I can imagine quite a few blurry images too from camera shake at those angles too. These photographers could no doubt have been getting superior angles with a vari-angle screen camera, and the similar image quality if they choose a APS-C sensor size camera like the Canon 70D or Samsung NX30 or the Nikon D5300. All of these cameras offer superior image quality, many lens choices and moving screens that help you get better angle shots when needed. It has the side-mounted version of articulating screens that I prefer. 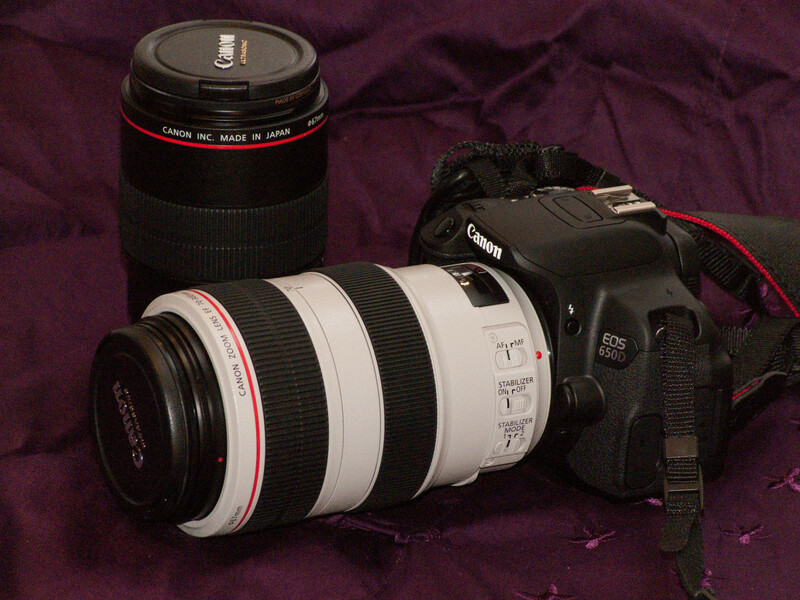 70d is a good, solid body if you already have Canon glass. Taking closeup photos of small things requires you to get close and shoot at odd and uncomfortable angles. This is where a camera with articulating screen really shines and shooting macro photography with a flip-out screen is heavenly compared to crawling around on your knees. Another benefit is that you can be much more discrete when shooting macro at arms length and approach small bugs and animals easier than with a camera where also you have to get in close to the action. Small bugs scare easily. The X-T1 is my nr.1 choice. it only has a vertically articulating screen, and it isn't the fastest of the bunch, and the Fuji lens lineup is nowhere as extensive as that of CaNikon or M43, but Fuji ave made a beaute of a body with a fantastic viewfinder and very very good image quality. Top choice! Flowers are a favorite closeup. This is an image I took one summer while I was experimenting shooting the underside of flowers. This is the kind of closeup photo that is impossible to compose when you also have to fit your head under the flower. Try shooting from unusual angles and you will see how your photos improve with better impact and unusual content. I like this image where the really soft colors of the petals clash with the hairy stem. While the 24 megapixel APS-C Nikon D5300 is marketed as an enthusiast camera, the superb performance of the sensor and body are making many pro's put it in their bag. While the sensor is similar to those found in Sony's latest flagships, Nikon has done their own magic and tweaked it to render smoother tones, with wider dynamic range and microcontrast clarity that actually trumps their own flagship. All other cameras in this section have APS-C sensors with a 1.5 - 1.6 crop factor. 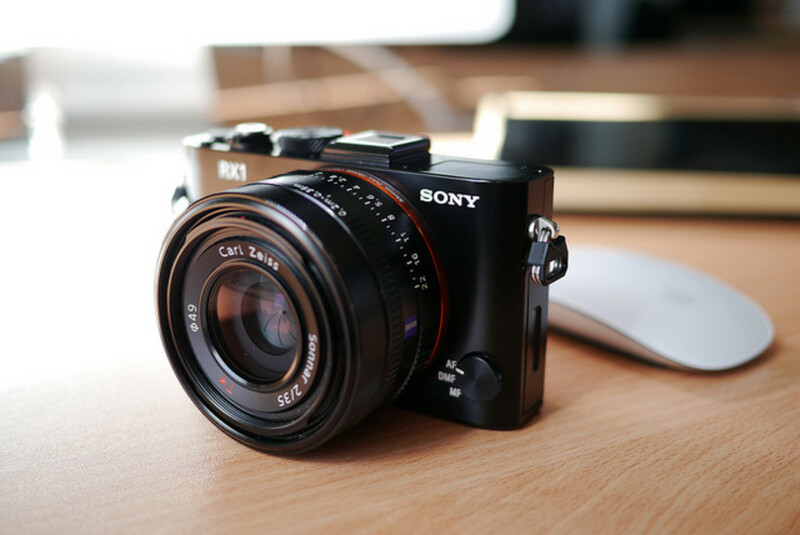 The M1 has a micro four-thirds sensor which makes it blazing fast, gives you extra range and puts it all in a tiny body. Huge amount of lenses to choose from. This one is my nr.2 choice. 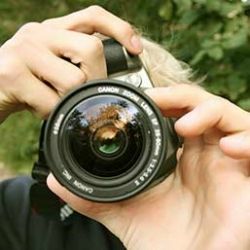 A Camera In Your Face - Or Not? Guess what: taking portraits and street shots with a camera to your face is killing most of your shots. As soon as you raise a camera to your eye people instinctively react and pose - or try to pose. A bad pose will always ruin a shot. When you shoot street photography, travel and portraits with a vari-angle camera you immediately notice how much better the shopts look. There are 2 reasons for this: 1) the subject is more relaxed when they can actually see your face.. 2) a lower perspective. shooting with an articulating screen allows you to take more waist-level shots which makes the person you are shooting look bigger. When doing travel photography, a flip screen camera allows you to be much more inconspicuous and discretely compose your shots, getting better travel photos. My pick of the best fixed-lens super-zooms with articulating screens. All of these have small sized sensors which offers extreme depth of field, but also limits resolution a bit if you pixel-peep. All of them are perfect all-in-ones for everyday casual shooting and will stand the test of regular-sized prints for the family album. Battle It Out - Good or Bad? 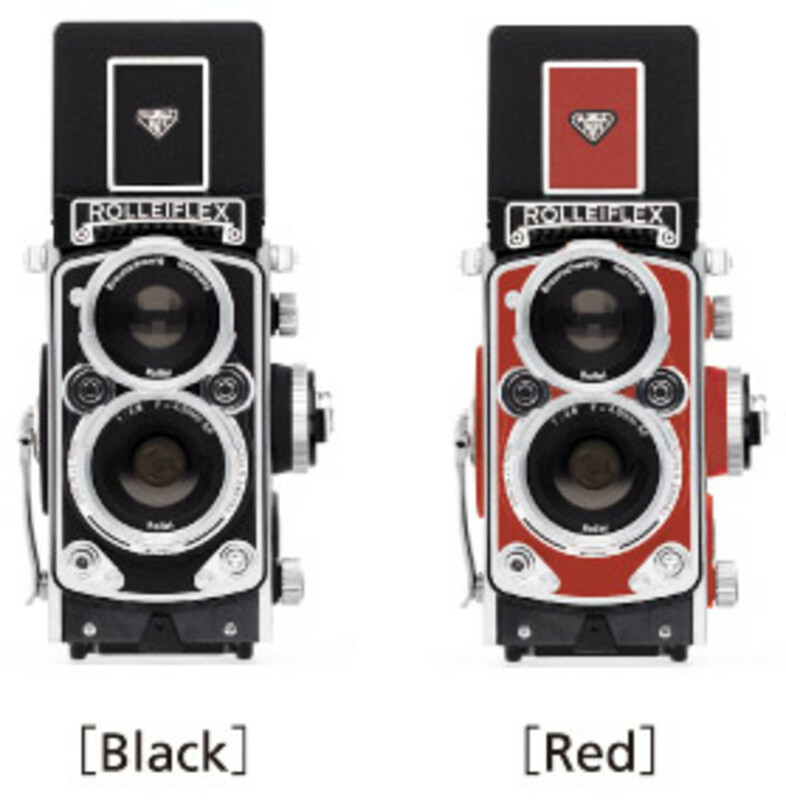 What do you think about flipscreens on digital cameras? 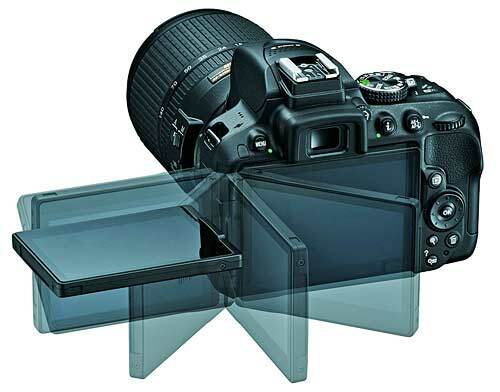 Which Nikon DSLR Camera For New Photographers? What Good Is A GPS Digital Camera?